Hello sweet Friends! If you’ve followed my blog for long, you know how much I LOVE yard sales. But I have also had over 25 yard sales of my own! I’ve learned a few things along the way and thought I would share what has worked for me to get the most out of all that hard work. Let’s face it, shopping yard sales is way more fun than having them, but if you gotta do it, you may as well do it RIGHT, am I right? Doing it right does NOT mean that you start digging through your attic the night before to see what you can get rid of. 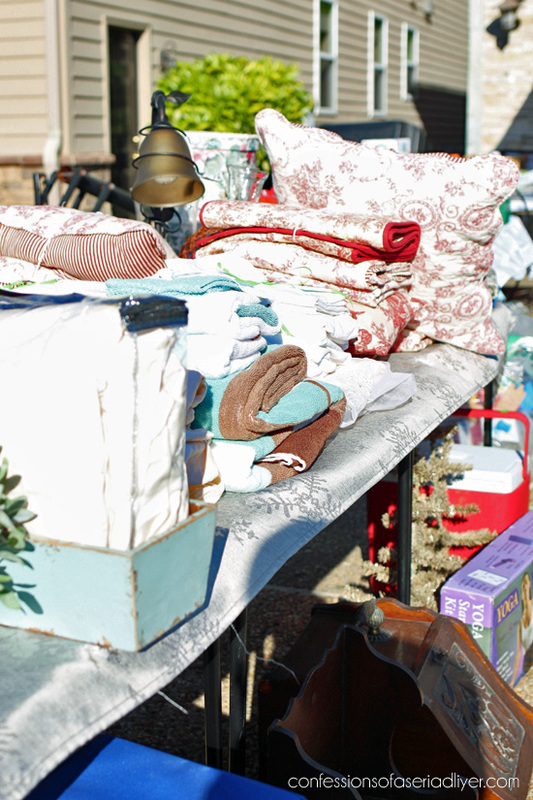 A successful yard sale takes planning. Then call a friend or family member to join you. The more stuff, the better! I would limit it to three people/families max to keep it easy to handle. Price everything. I mean EVERY thing. You don’t want multiple people shouting at you for prices while you’re already helping someone else. 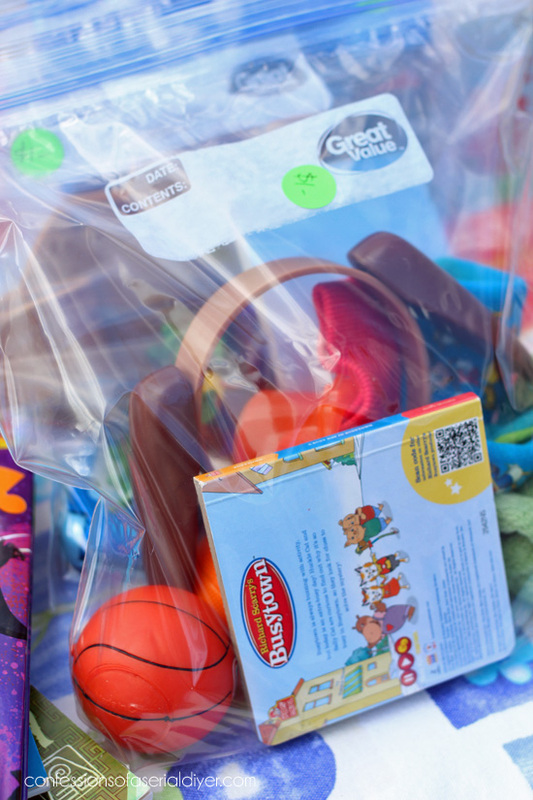 This is my biggest frustration as a yard sale shopper, and I often won’t buy anything if nothing is priced. Price to sell or be willing to negotiate. The goal is usually to get rid of stuff! Price everything in 25¢ increments for easy adding. 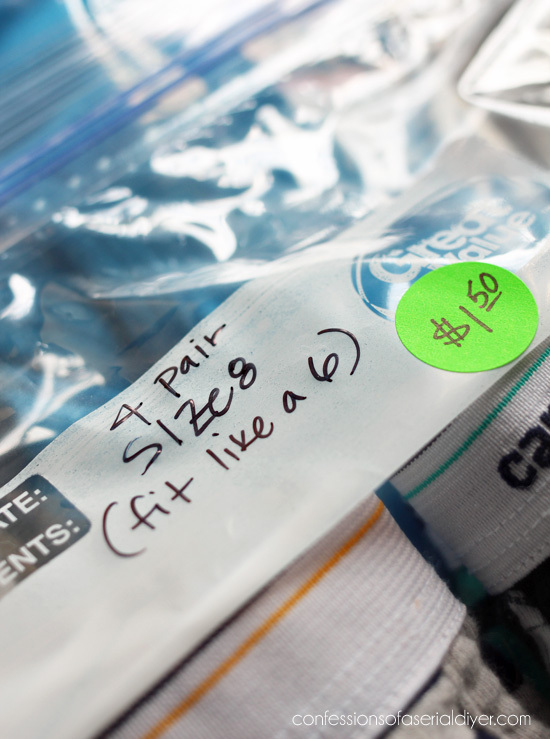 Avoid the “yard sale” stickers that are pre-priced. If more people will be joining you, have everyone use different colored pricing stickers to designate what items belong to which person. I always use green stickers I buy at Office Max in my area. 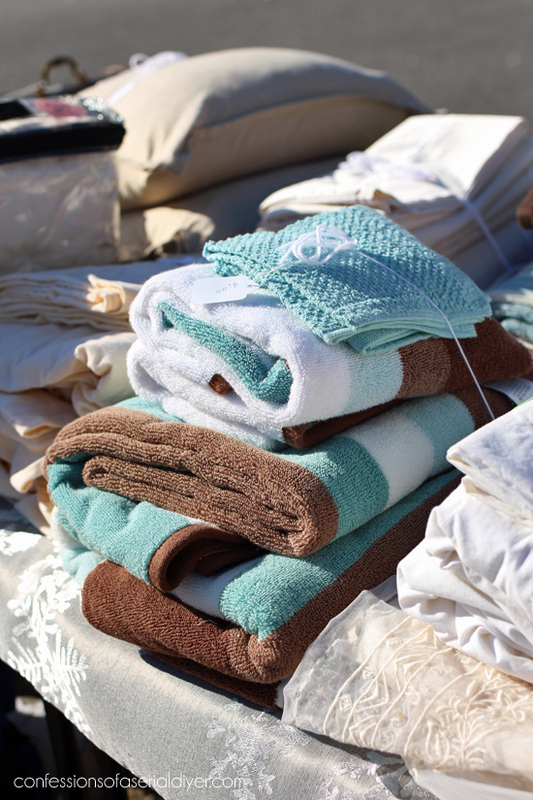 They are so much easier to shop and sell like hotcakes at a dollar a piece, and I am thrilled that someone else will get good use out of them. Usually when the bin is almost empty, I will slash the price to 50¢, but almost all of them sold this year. 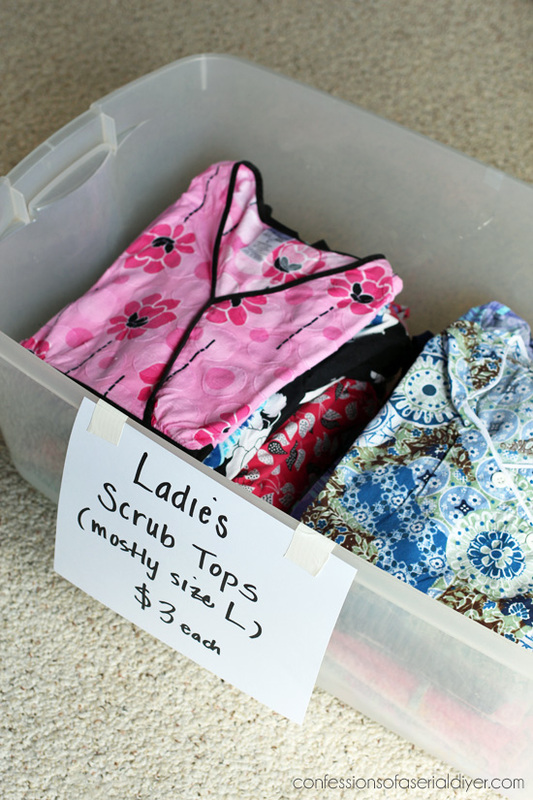 These are so much easier to shop than laying everything out on bed sheets on the ground, and I reuse the same clear bins year after year. If they are not in the budget, boxes in good condition will probably work too. 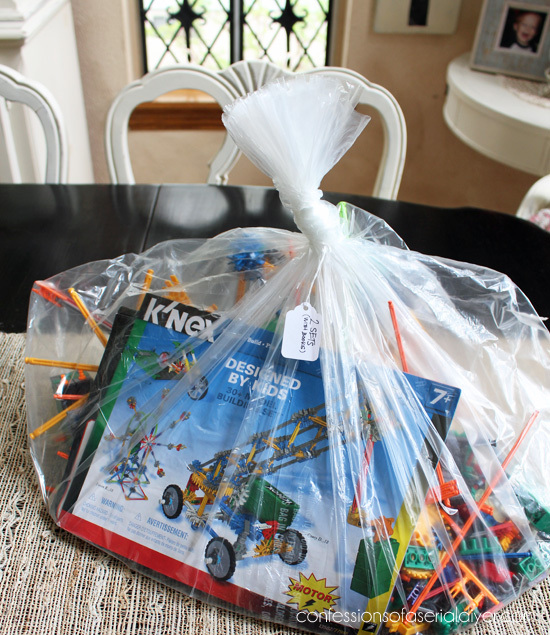 Clear kitchen bags and gallon zipper bags. One lady bought both bags I had. I probably wouldn’t have sold it all had everything been laid out separately. I sell a bunch of these! Get as much on tables as possible. My parents and I did craft markets for 15 years, so I am lucky that I have five five foot tables from that business to use, and I use them all, plus two card tables. If you have to use two saw horses and a piece of plywood, if you have to drag your patio table around from the back yard, do it. 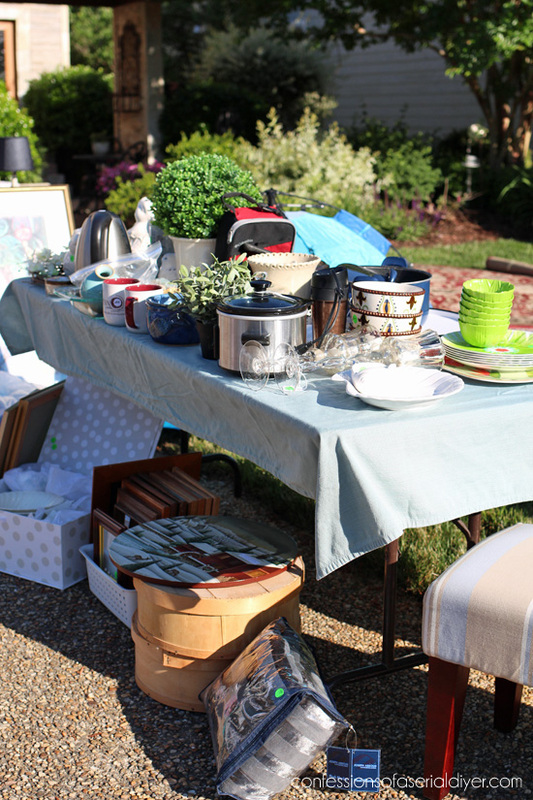 Your yard sale will look more worth stopping at if everything isn’t just spread across the driveway. 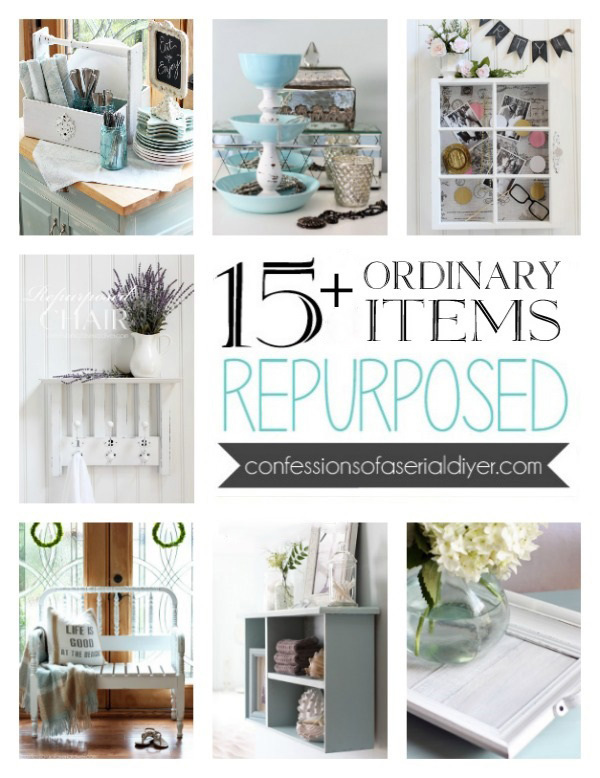 As items sell, continue to move things up to the tables from the ground and reorganize. Hang adult clothing if possible, or at least keep it off the ground. I have a four way clothing rack from my retail days long long ago. I used to go to the warehouse every year and borrow one and they finally just told me to keep it. 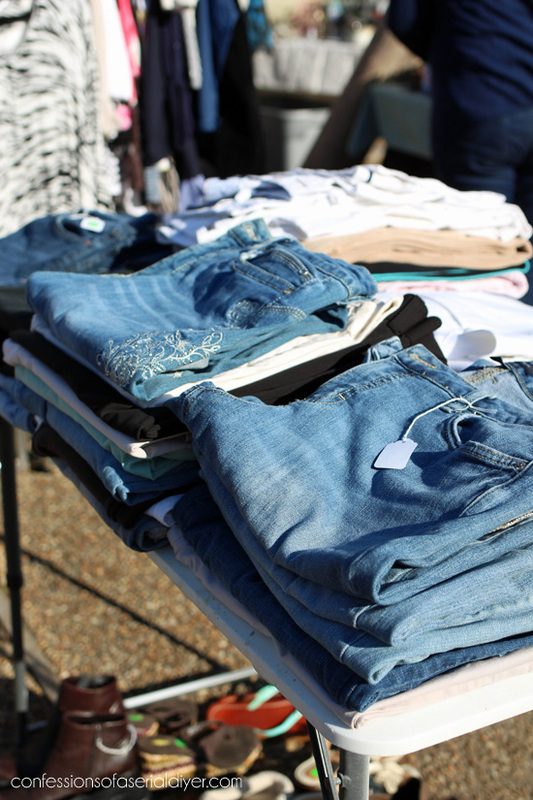 Clothes sell really well and I know hanging them helps them sell better. You can also use two ladders and a large wooden dowel, but rig up something if you can. Just try to keep it off the ground if you can. We used hang tags and I added a green sticker to those that belonged to me. You can barely see the clothes rack in the background there. For the hanging clothes we also used hanging tags and just added our color sticker to them, and hung them on the neck of the hangers. Clean your items. No one wants to buy your dirt. 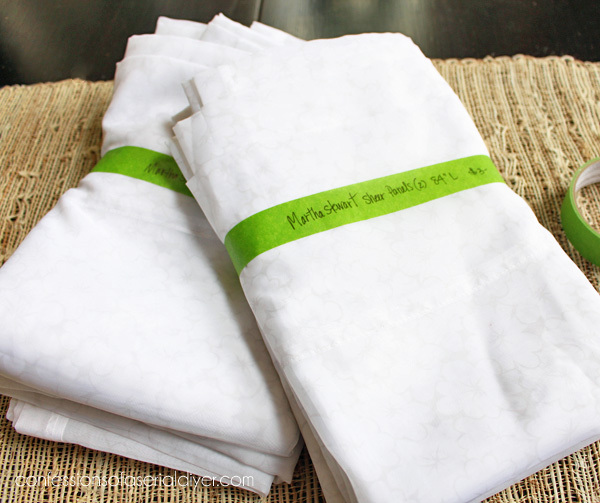 I didn’t wash all the clothes because they were already clean, but I did wash many of the linens. If you are selling anything that can easily be wiped down with a Lysol wipe, take the time to do it. That goes for dishes, toys, baby gear, and anything else that can accumulate dirt and dust. Start with fluorescent posterboard. It is like 77¢ at Walmart, not a bank buster. I cut them in two to get two signs from one piece. 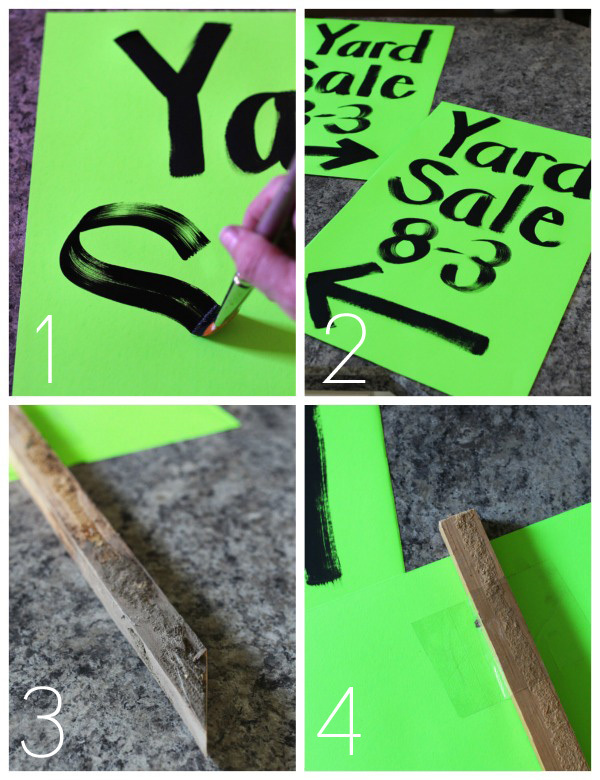 And no need to bleed several black markers dry, opt instead for black craft paint and a brush to paint your signs. Let the top of the wood post stick up just enough that you can hammer the top of it without smashing your sign. Attach the posterboard with good quality tape. Now you don’t need to rely on lamp posts, sign posts, etc. When putting your signs out on a busy road, don’t put them right at the intersection. Put them before the turn lane to give drivers enough time to get over. Be a courteous neighbor and take your signs down when the sale is over. Be ready to sell. 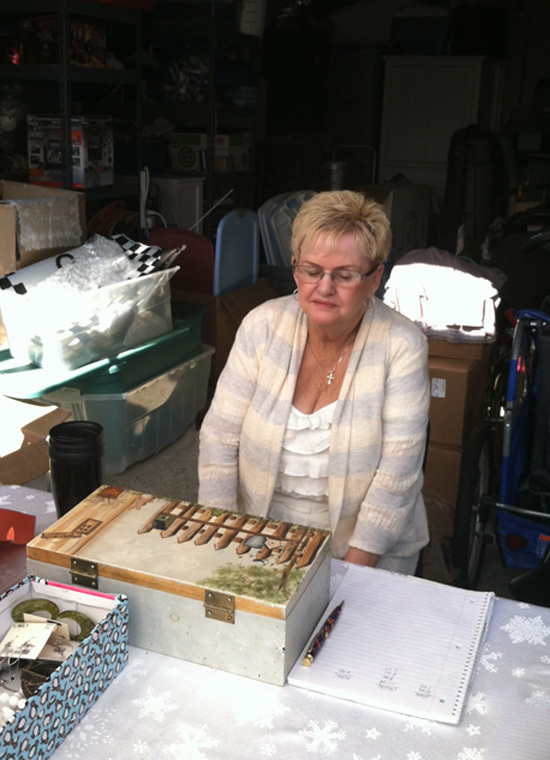 (My Mom will love me sharing this picture of her from a yard sale we did a couple of years ago!) Designate one area to be used to take in all that cash you’re going to make. I use a small table at the front of my garage. That’s our money box. She was selling it several years ago, and we ended up using it to collect the money. We use it every year now and call it our good luck charm. 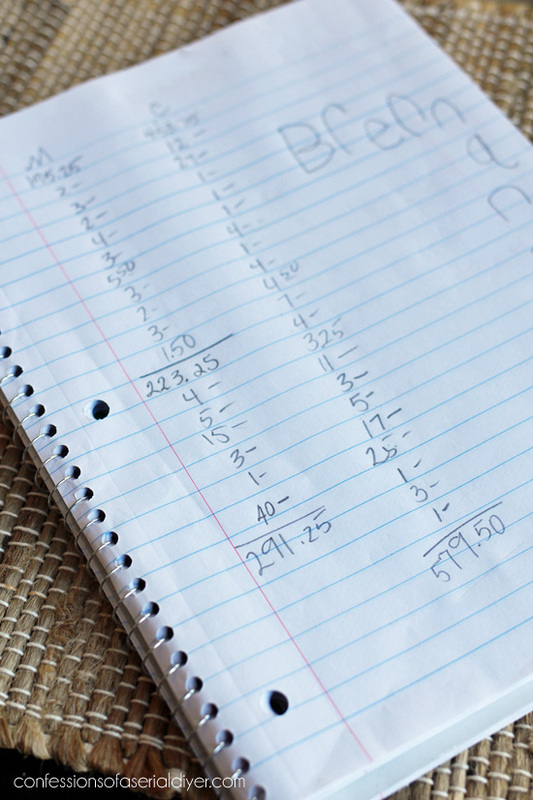 We tally what we sell simply with a notebook and a list for each person with stuff to sell. 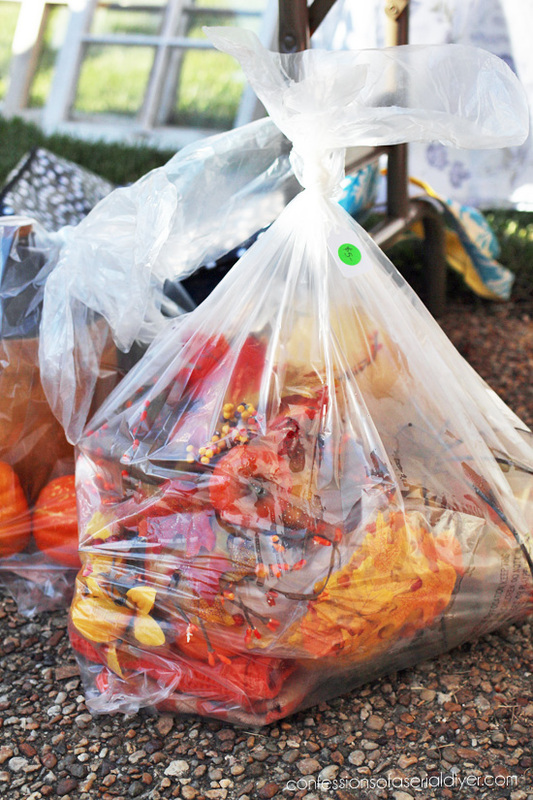 Save several grocery and shopping bags the month prior in case someone needs a bag. 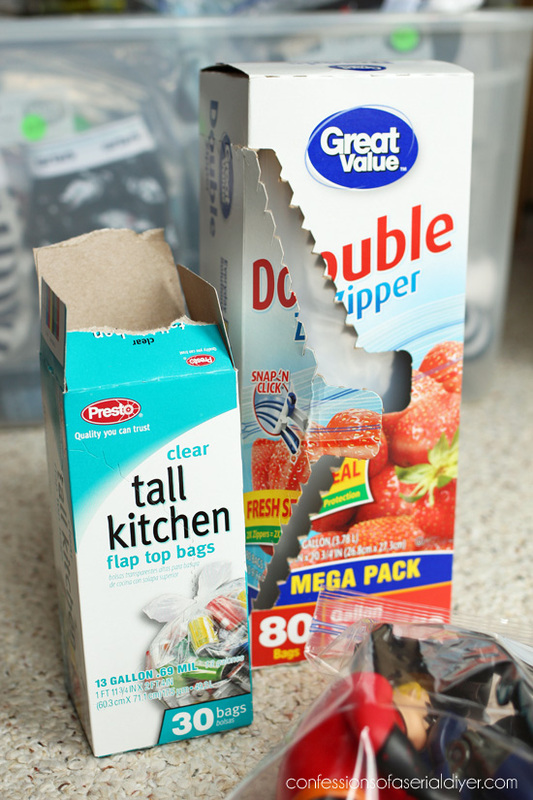 Have newspaper, tissue paper, or small empty boxes handy if you have a lot of breakables. For change, start with $50 in ones, $50 in fives, and $3 in quarters if you can. That should ensure you have enough change to last the day. 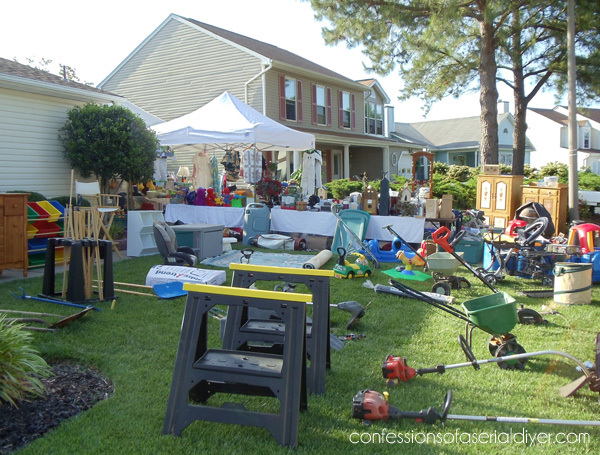 Want to see the most ridiculous yard sale my family has ever had? SO MUCH STUFF! This was at my sister’s house. She and my parents were getting ready to move. I wish I had taken more pictures! I also wish I had taken more photos of our yard sale we just had, but we got so busy so fast. I think you get the idea though. 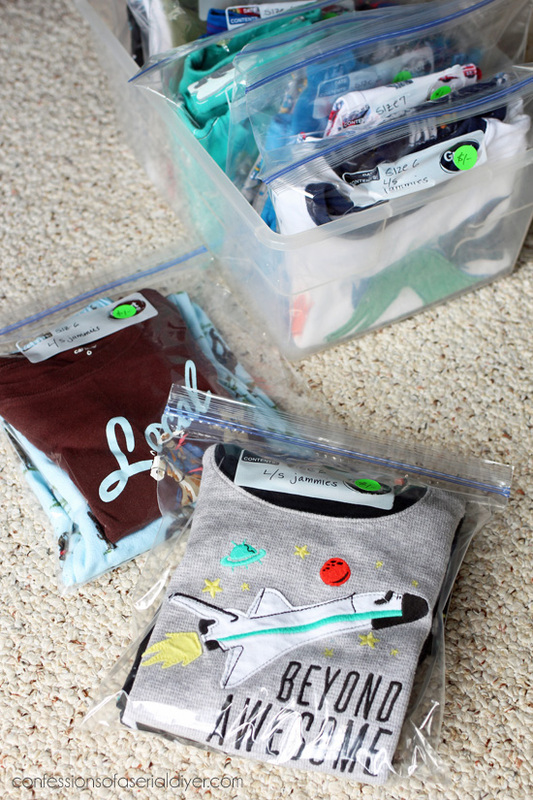 Start early, organize and price everything beforehand. Make good signs. 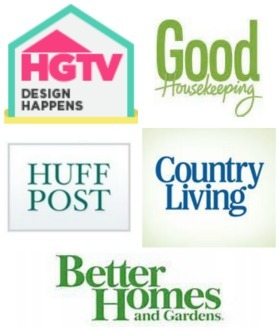 You can give a shout out on Facebook leading up to the sale and again the morning of with pictures, or list on Craig’s List a couple of days prior. You might need to if you live more off the beaten path. I’m trying to be good and work through all those small pieces left in my stash. 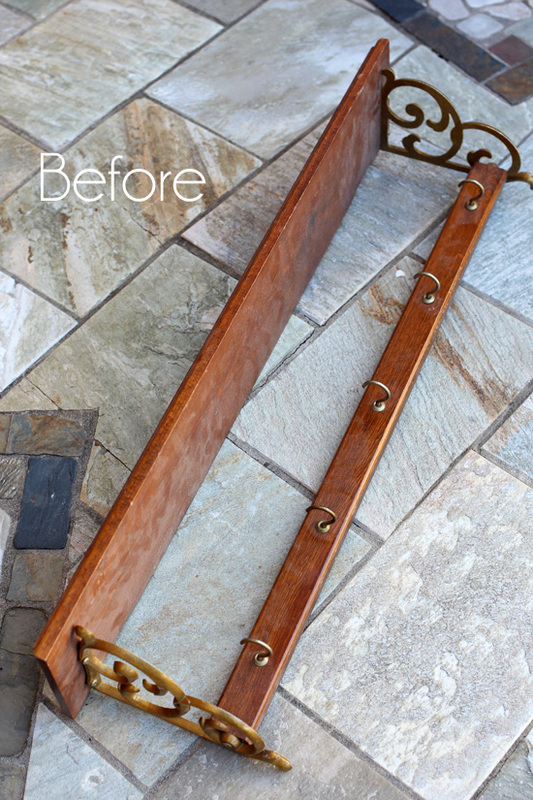 UPDATE: Check out how this little Home Interiors shelf turned out now HERE. Wow, that was some yard sale! How much did Brennan make? I noticed he left his mark on the money page! Yeah, best to keep the smalls away, since they usually don’t like seeing their stuff sold. Too bad I live 200 miles away, or I’d have bought your mother’s towels! And the red toile bedding, too. Thank you for the wonderful ideas! I will be printing out your tips and keep them handy for the next yard sale we have. When my granddaughter was a lot younger she wanted to be involved in our yard sales too so I’d buy canned soda and water bottles. She would sell them for 50 cents each and got to keep the money (but only if she stayed at her post). Sometimes she would make more money than the rest of us! LOL. Now she’s 25 and she still talks about our yard sales. What great memories we share! Great tips, thanks! I will put those to good use. We are going through our house and trying to purge all the junk we don’t need. Whew it sure is a long process. Where do we get all this stuff?! 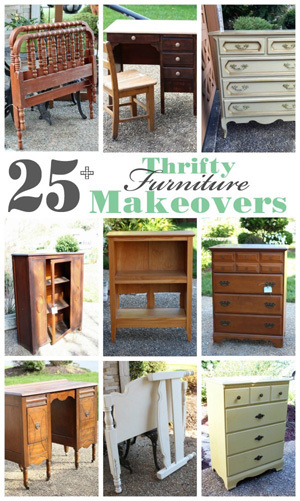 LOL And I paint furniture also, so I’m going through that and getting rid of the things that I have no inspiration for. So there is definitely a yard sale in our future. I think it needs to be sooner rather than later. We can’t get to anything in our garage. 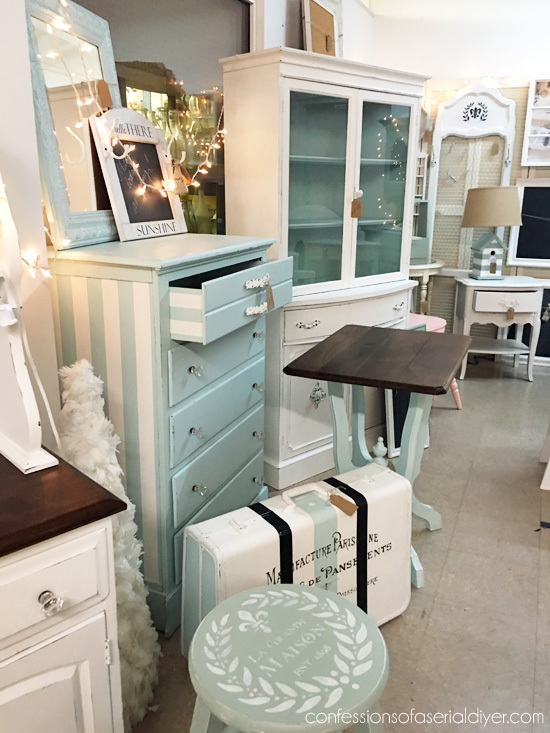 At your large garage sale…there was a jelly cupboard and a dish cupboard in the back! 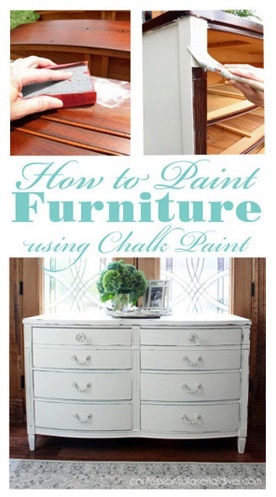 (yellowish paint)…WOW…that’s my kind of thing! Hope she got a good price for those antiques. 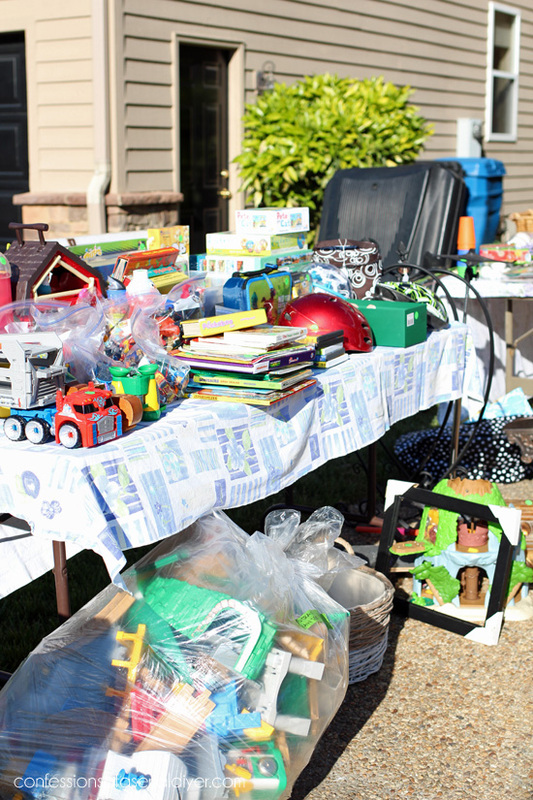 i am a garage sale junkie and I HATE…”make us an offer” (this is on everything out. )… too lazy to price. Not many are as organized as yours. I kept finding myself “shopping” your yard sale items. So funny! Thanks for the tips! Great timing! 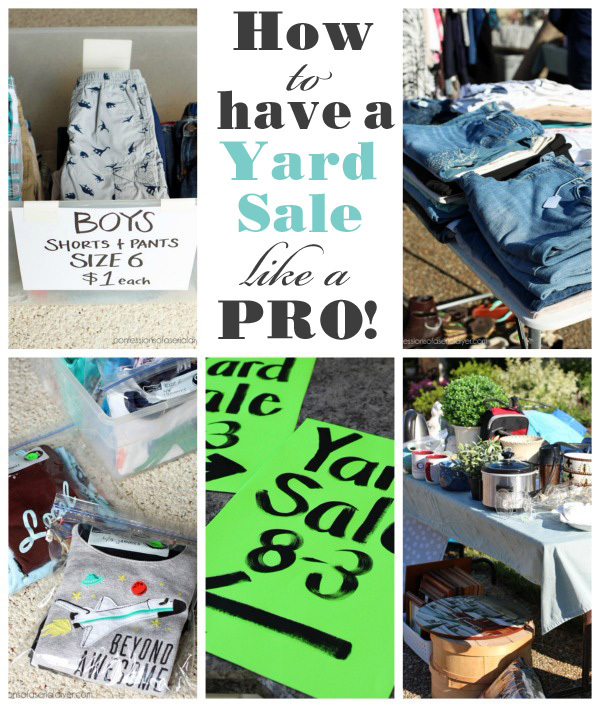 My yard sale is tomorrow and I use every one of these tips each time I have a sale. I do one thing differently that has made it a lot easier- I price everything $1.00 and up- no change to worry about! 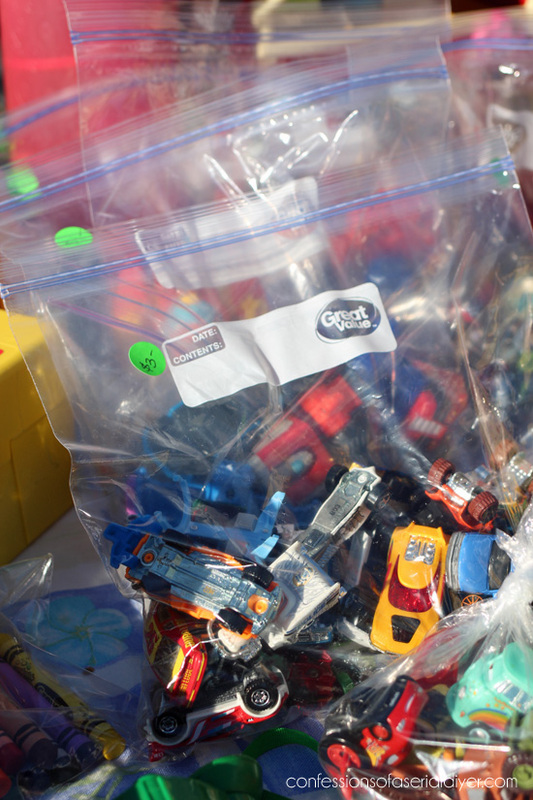 Just like you, I bag items together to make small items come together to sell for $1.00. So much easier for me. Thanks for all your great projects and posts. I get so much inspiration from you lovely lady! Thanks so much for the great tips!!! I am getting revved up for mine now! I have giant tubs full of items to be priced. I hate making offers, when things aren’t priced..I figure it is yours put a price on it and then we can dicker:) lol.